If you’re among the growing number of people who take vehicle emissions very seriously, you may be interested in something other than a traditional gas-powered car. Electric vehicles, or EVs, are becoming increasingly popular among average consumers, what with growing options, lower prices, and further driving distances. By the end of 2015, US drivers had snatched up 400,000 EVs, and this number is expected to keep rising in the coming years. Is an electric vehicle right for you and your family? Here’s what you should know before you trade in your gas tank for a battery. Some people mistakenly use the terms “electric vehicle” and “hybrid vehicle” interchangeably. However, they are not the same thing. Hybrid vehicles rely on a mix of gasoline and electricity. You still fuel them up at the gas pump and the battery charges itself as the engine runs. Plug-in hybrids run almost exclusively on electricity, with the gas tank reserved solely for long drives when the battery runs out of juice. On the other hand, electric vehicles operate purely on battery power. Instead of refueling at gas stations, you power up your car at charging stations. Many of these are scattered around Fort Collins, and you can have a charging station installed at your home as well. Electric cars produce no emissions from the tailpipe, which is great for the environment and exempts you from bi-annual vehicle emissions testing. 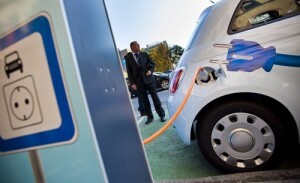 Electric vehicles operate more smoothly than gas-fueled cars. Over the course of their life, EVs require less maintenance than combustion engines because they feature fewer moving parts. Driving an electric vehicle lets you take advantage of the carpool lane even if no one else is in the vehicle with you. Purchasing an eco-friendly vehicle may qualify you for a tax break. You never have to visit a gas station again. You can even install a convenient at-home charging station right in your garage. Your utility company may offer you a discounted rate on electricity used to charge an electric car. Electric vehicles cost more than their gas-powered equivalents. Only a limited selection of electric vehicles are available at this time. EVs must be recharged far more often than gas-powered cars must be refueled, though advances in battery technology are steadily improving driving range in new electric cars. Charging stations are few and far between compared to gas stations. However, Fort Collins boasts a growing number of public and high-power charging stations, especially around CSU. Check out this interactive map at Plugshare.com for more information. Depending on the EV you purchase, charge times could be lengthy. Charging at home could significantly increase your electricity bill, though discounts from your utility company help to offset these costs. Research tax incentives: The federal government offers tax credits for purchasing qualified EVs, hybrids, and other alternative fuel vehicles. Colorado offers great tax incentives as well, including income tax credits and a sales tax exemption on qualified alternative fuel and low-emission vehicles. Ask the car salesman you work with about your eligibility for these incentives. Check warranties: Read EV warranty information closely. If the battery fails prematurely and you have to replace it, who’s responsible for footing the bill? Compare driving ranges: Historically, electric vehicle driving ranges have rarely been above 100 miles. However, EV manufacturers are upping their game to attract more customers by introducing 200-mile EVs at prices the average consumer can afford. If you want to drive to Denver and back in an electric car without fretting over finding a charging station, this is great news. Shop around: EVs today start in the upper $20,000s, but luxury models cost $80,000 and up. Shop around, look for deals, and remember to take tax incentives and other benefits into account as you compare costs. At Scott’s, we have experience servicing and repairing a wide range of makes and models, including electric vehicles from today’s top manufacturers. Whether you need simple maintenance performed or a major repair, visit Scott’s Auto for help. Feel free to schedule an appointment online or call us at 970-682-4202.